The 10 in. 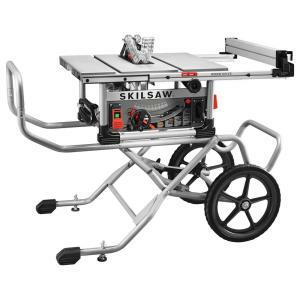 Heavy Duty Worm Drive Table Saw is the latest addition to SKILSAW's table-saw lineup. SKILSAW's legendary Worm Drive power train delivers superior torque, an aggressive 3 in. D of cut, and 30 in. rip capacity. Tear through plywood and slice 4x with ease and precision. The rack and pinion system makes fence adjustments quickly and smoothly for accurate cuts. SKILSAW's patented Dual-Field Motor runs cooler so it can work harder, longer. The rugged stand delivers dependable stability, and the 16 in. wheels easily take stairs and roll over uneven surfaces to just about anywhere you need to set up and let it rip. Tbook.com crawls the web to find the best prices and availability on Table Saws and related Tools and Hardware products like Skilsaw 10 inch Heavy Duty Worm Drive Table Saw 15 Amp Corded Electric with Stand. For this page, related items include products we find that match the following keywords: "Table Saw" at our vendor partner Home Depot. Skilsaw 10 inch Heavy Duty Worm Drive Table Saw 15 Amp Corded Electric with Stand is one of 60 Table Saws and related products listed in the Tools and Hardware section of Tbook.com If you have any questions on this product, please give us a call at 734-971-1210 during the hours of 9am - 5pm EST for assistance. Thank you for shopping at Tbook.com, the Internet Department Store!